We've done a makeover of sorts. Our permanent Guest Designer is now just another "chick"! So we changed our name and made a few minor adjustments. Overall we're still the same but with five us now, we figured a new name was in order. Leanne, one of our wonderful leaders is our hostess this week and she's wanting us to hob knob a bit with mother nature for our twist. I'm trying to begin the new year out in a more proactive, mindful way. One of those ways is to use up as many backgrounds already created by me, scraps, spare dies, AND all my NBUS (never before used stamps/dies) that need some love. I did so with this card. I had this beautiful background piece I made with alcohol inks. 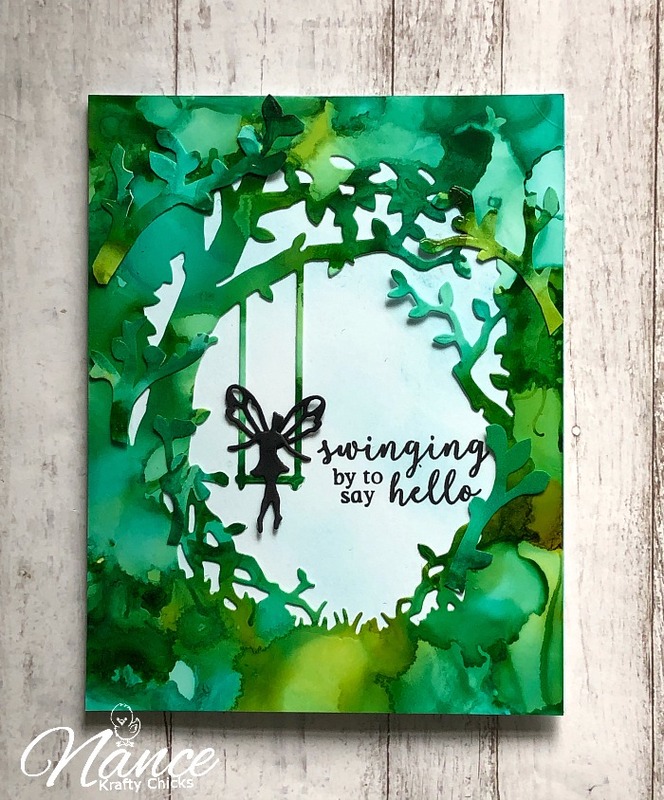 I used a die from the May 2018 Kit by Hero arts that is all about trees and swings. I used the inner oval die of the kit and then took some of the other tree branch stamps, stamped in Versamark onto some of the background scraps, clear embossed and fussy cut them to add a little more depth and interest to my tree. I thought it would be fun to use one of the new fairy dies I just received from Poppy Stamps and place her on the swing. I mean fairies love a good tree swing too! Go hop over to the Hen House and check out all my Krafty Chicks teammates' projects for more inspiration for our "Tree twist". Then, get cracking on your new year of crafting and come play along with us! New name for the challenge and new look for your blog. Awesome! Love this background and it's perfect for this hideaway for the fairy! Perfect sentiment too! Super cool friend awesome card! And the fairy on the swing perfect. Nicely done friend. Hugs! This is just so cool Nance!!! Love how you created this scene - happy new year to you and here's to an amazing 2019!